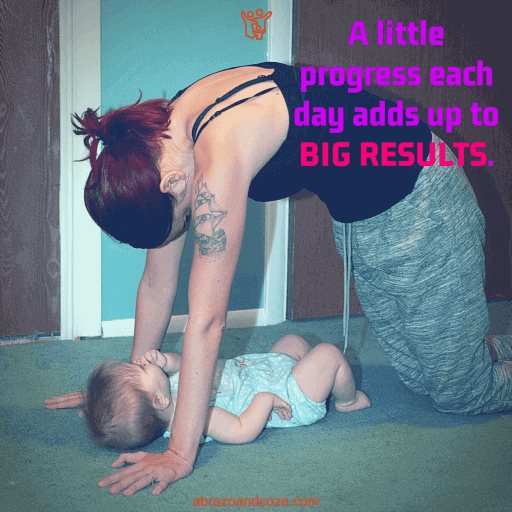 Birthing a baby is hard work, and once you’ve got your wee babe snuggled in your arms, eventually you’re going to want to start being active again. But there are certain exercises that are more harmful as your body heals, so it’s important to choose your postpartum exercises wisely. 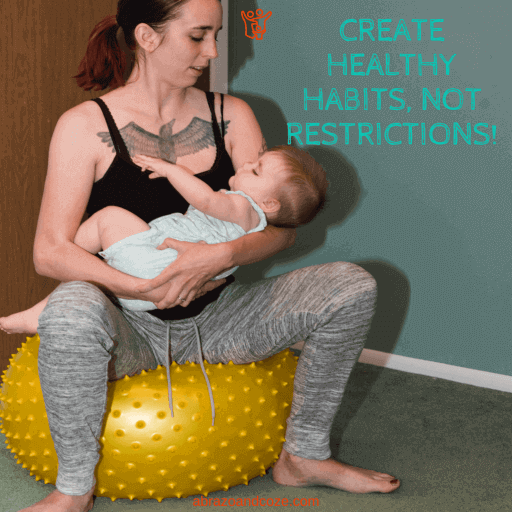 It’s been 1.5 years since I had a newborn, and quite honestly, I might have only recently begun being motivated to get moving since my middle child was born (that was 4 years ago)… so I am NOT the person to be telling you all about how to get back in the movement groove after giving birth. That’s why I’ve enlisted help from Rebecca Carr, a real life athletic mom with a passion for sharing her healthy lifestyle. Rebecca believes we are all born to move! After over 15 years teaching and researching gymnastics and natural movement and raising three “natural movers” of her own, she has a lot to say! Rebecca created Innate Moves in hopes to teach and inspire you to find freedom in your body to move the way nature intended! Carrying and birthing a baby changes you in a way nothing else can. Getting your body back to feeling normal can seem daunting at first, but don’t let it! Your body has already begun the healing process without you having to do anything. You can help your body heal and help yourself get in shape by adding a postnatal fitness routine. Gentle postpartum exercises are an ideal way to spend time with your infant, while getting a workout in for yourself. You may consider helping your child get a good start on physical health too, with these baby gymnastics exercises you can begin at birth! Remember to go easy on yourself after birth. It is normal for you to feel different, tired, and uncomfortable. Follow your body and how you are feeling and don’t push yourself too hard – you just had a baby! Talk to your practitioner before beginning your postnatal workout routine, but more importantly, go with your intuition on when you are ready to move more. Everyone heals at different rates and you are not helping yourself recover faster by pushing yourself harder. Though society seems to have agreed it takes six weeks for a woman to recover from birth, that is a completely arbitrary amount of time. Postnatal workouts can actually assist in recovery, but only if they are done safely and at your own pace. Some women are eager to move before six weeks, while some women are more comfortable lying and snuggling with their baby. Before beginning the exercises listed, start by simply moving more. Walking is one of the best postpartum exercises you can do and you can use it as a gauge to see if you’re ready to begin more. Involving your new arrival in your postnatal fitness routine benefits you both. Use it as a time to play and connect to your baby. Try to touch or maintain eye contact throughout the activities. You have probably found your infant to enjoy gently up and down bouncing by now! You can easily turn this into a workout for you. Bouncing on a big exercise ball is a great workout for your entire body, especially your torso, which is generally weak post-baby. Hold your child over your chest, making sure to keep your back straight. Your arms should be doing the work to keep your little one up, your back/torso is holding you upright, and your legs are working to bounce (do not lift your chest up and down to bounce, it should all come from your legs!). If you can keep your back straight while doing it, you can hold your little one in a cradle hold and even nurse while bouncing. Precautions – hold baby’s head to your shoulder to protect the neck, or bounce extremely gently. Hold baby with your arm strength, don’t let it pull on your back, it should stay straight. Laying on your back, hold baby chest to chest. Lift your infant up by holding them around their chest, maintaining their horizontal body position. This gives him/her a great back workout too (helpful later for crawling)! For an added challenge, lift up and down slowly. Precautions – Make sure your knees are up, feet down on the ground and that the small of your back is pressing into the ground. If you find it hard to keep your lower back on the ground, elevate your head and neck with a pillow. Stay in the same position as for airplane, but lift your feet by bringing your knees in more to your chest. Place your child on your shins, but keep holding on to him/her. Lift your feet slightly up and down. Another option is to lift knees just a bit forward and backward, watching that they don’t go any further than your hips. Precautions – if your lower back pulls off the floor keep your knees in closer to your chest. You should not feel this in your abdominals. If you do, keep your knees closer or stop the exercise until you build up strength. Typical push ups should be avoided while your abdominals are recovering from being pregnant. However, you can still work your arms, and play with your baby at the same time! Put your infant on their back on the floor. Get on your hands and knees so that they are lying between your hands. Keeping your arms straight, move up and down with just the movement of your shoulders. You are simply moving your shoulders forward and back (like a sideways shrug), pushing away from the ground and back down. This warms your shoulders up and may be enough for you for a while. Now bend your elbows backwards while bringing your face forward and down closer to your baby’s. Don’t let your elbows go behind your wrists, but instead bring shoulders forward as you bend the elbows. You may only be able to bend slightly, which is fine. Come back up and repeat. Precautions – do not let your elbows bend backwards, your forearms should remain parallel to the ground. Cat and cow are popular yoga positions and are very gentle but therapeutic for the spine. Begin on all fours with your infant lying on their back between your hands. Release your abdomen completely to gravity and try to keep a straight back. Now exhale, round your back, tucking your head in to chest for cat pose. Inhale as you come up to cow, releasing your back and bringing your head and tailbone up and away from each other. Play peek-a-boo at the same time, “hiding” your face with each cat and bringing your head up with a “peek-a-boo!” on each cow. Precautions – do not over-extend your back on the cows. 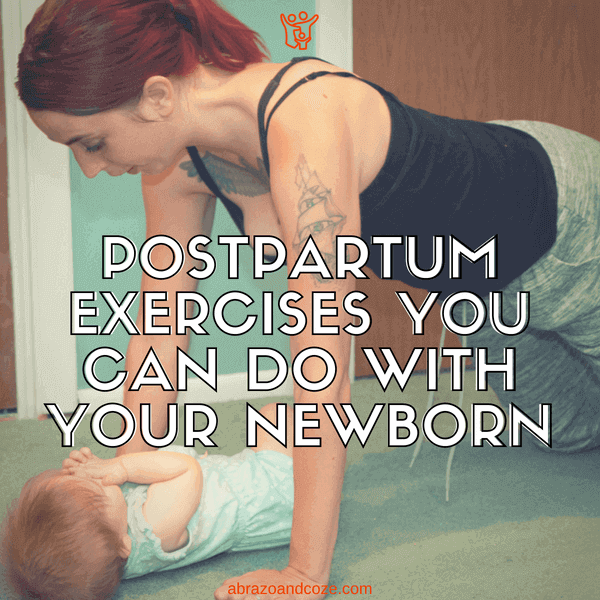 As you can see, postpartum exercises are easy to do with your newborn. Now that you’ve got a starting point for creating your exercise plan, it’s time to start moving! Have fun, and listen to your body – if it feels uncomfortable, ease off. If you’re just not sure when to fit in some exercise, try adding it to your morning routine, or during your evening routine after supper. 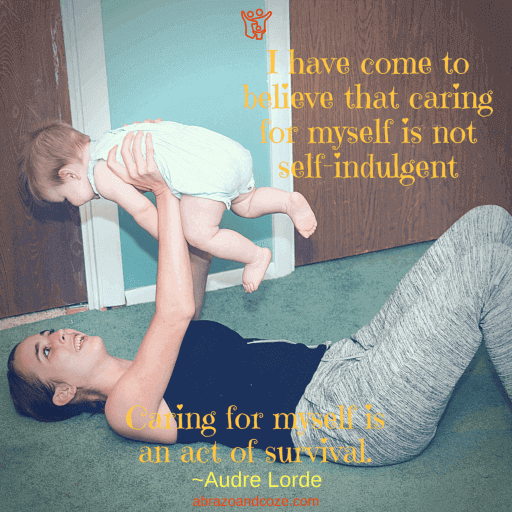 I’d like to take a moment to say thanks to Audrey from Mommy Enlightened, and her lovely babe, for modelling for this post. 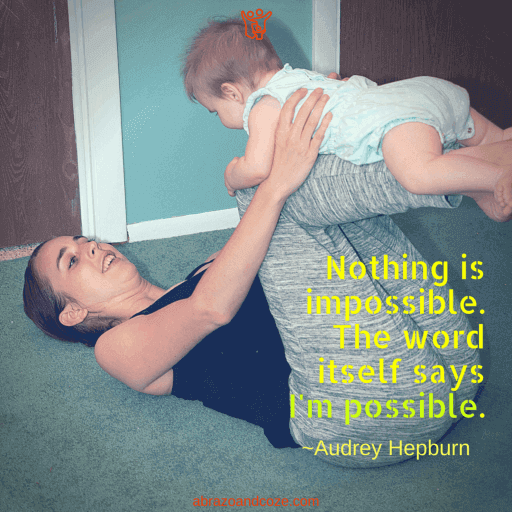 Have you found any other simple moves that you like to do and that are safe for postpartum? Let me know in the comments. Rebecca Carr believes we are all born to move! After over 15 years teaching and researching gymnastics and natural movement and raising three “natural movers” of her own, she has a lot to say! 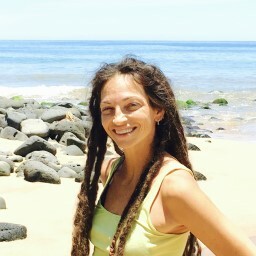 Rebecca created Innate Moves in hopes to teach and inspire you to find freedom in your body to move the way nature intended! These are some great exercises to do with your baby! I’ve done leg lifts with all of mine but shoulder extensions are a great idea! Such good quality time with your little one! These are great tips! I can’t imagine how tough it would be to find time to exercise after giving birth, so finding ways to exercise with your newborn is genius! Love it! I don’t have any kids but maybe I’ll see if I can get my cat to participate in these with me! (not likely) Love them anyway!! I don’t have any babies yet, but I have no doubt in my mind that I will someday! This is such a valuable resource for new moms trying to recover and stay healthy! Thanks – these seem very useful. My twins are now 20 month olds – i hope these will still be useful? Yes, they are useful at any age (added bonus – your older babies weigh more, so your muscles get an even better workout). The baby in the photos is 10 months old. I bet your twins will love playing with mommy doing these! Let me know how it goes. I like to do Leg lifts and airplane. I did not know about the advantages it can have. I do those both, also, because all my kids think it’s really fun! This was such great information. While sometimes I feel that postpartum exercise posts can be slightly impractical, this one consisted of great exercises to promote healing after baby. I love it! Thank you for sharing this, Mama! Glad you liked it. I also see some of the postpartum workouts and wonder how anyone could manage to do them without prolonging their healing. I bet you would… and if your baby is anything like any of my three, they will have so much fun, you’ll be doing leg lifts and airplane for a long time to come. When my eldest was about 3 or 4 she still loved “flying”.